On Monday (August 20) our trip west officially began. 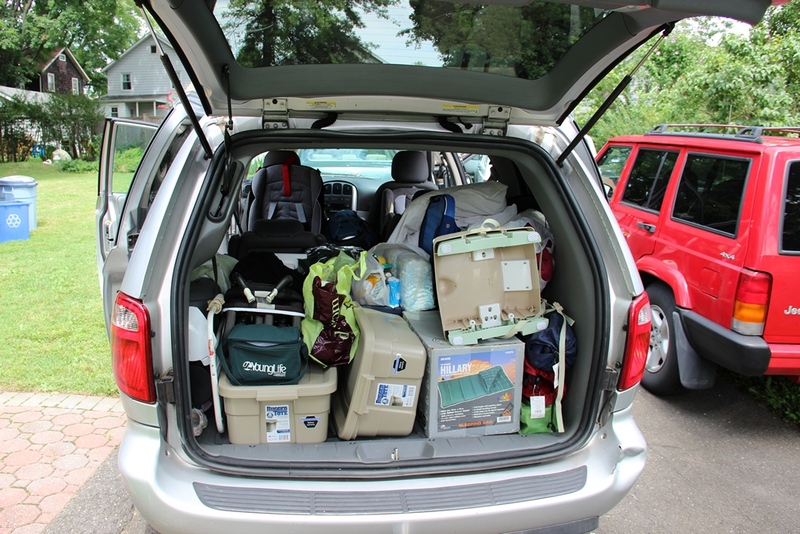 We loaded up the minivan in the early afternoon and drove about 150 miles to Shippensburg, PA. 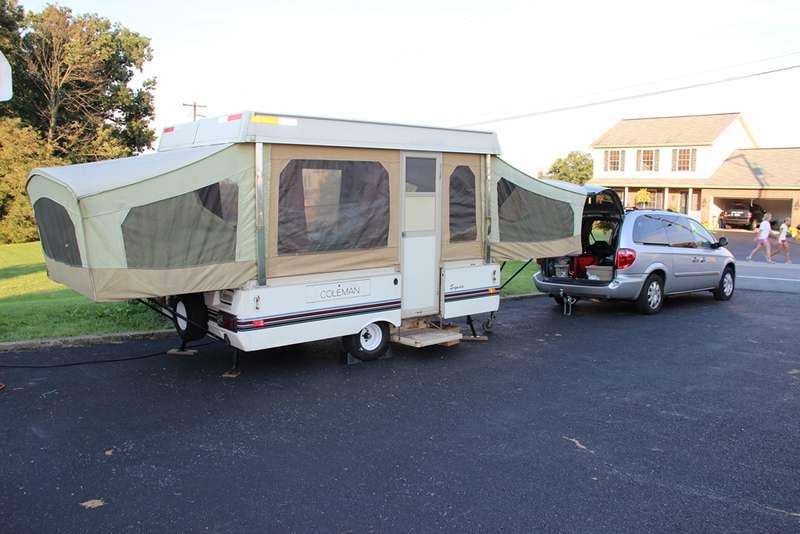 It was not without a bit of apprehension that we pulled up out front of the Rockwell’s home as we anticipated our introduction to the pop-up camper that will be our home for the next three months. 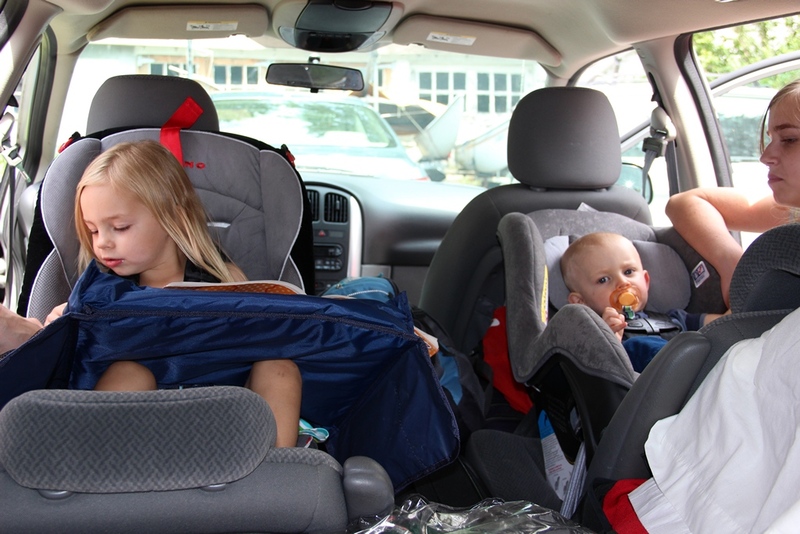 The kids are buckled in and ready to head west! We were both pleasantly surprised to discover how spacious and open it is on the inside! For something that folds up so small and is so light to tow, we really do have a lot of living space in there. I suppose it all depends on what you’re used to. Staffan and I used to do a lot of tent camping in a tent that was small and light enough to carry around all day, so in comparison this feels palatial. On one end is a queen-sized bed that we’re sleeping in, and the other end pulls out to a double bed that the kids are sharing. In between is a small kitchen-ish area and a table area. This is how the kids are sharing the bed. 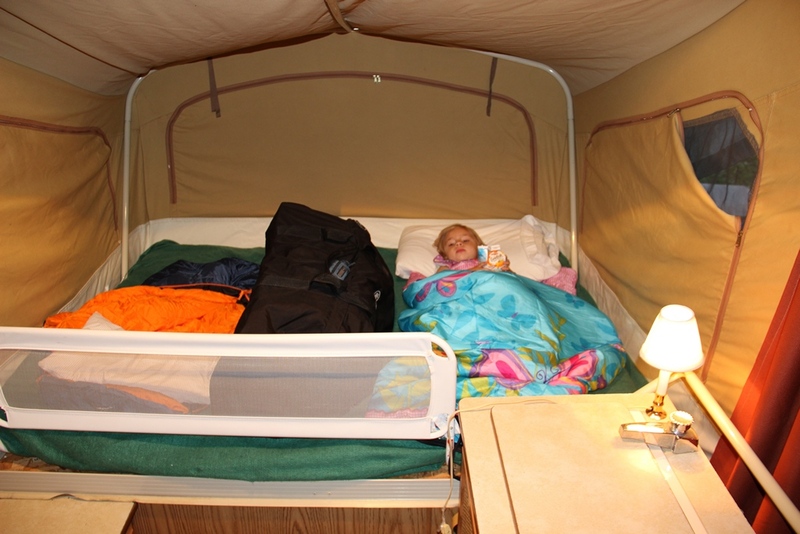 A duffle bag and a bed rail turned out to be a great solution! 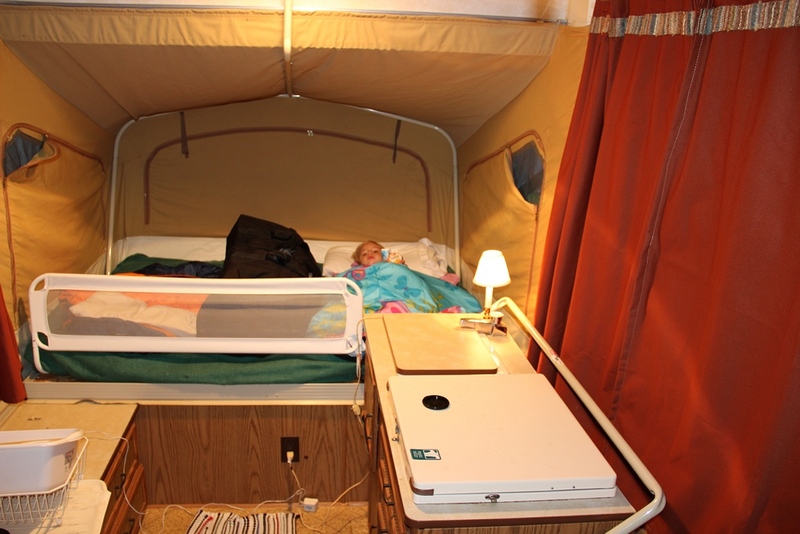 We’ve slept two nights in it parked in people’s driveways, and tonight is our first night in a campground. We rolled in a little later than planned and are still a little slow and inefficient at setting camp, so dinner was cooked under the stress of fussy hungry kids and parents who can’t seem to find anything when they’re looking for it. Needless to say, there were no pictures taken of our first meal cooked in the camper kitchen, but pictures will follow in a later post of a calmer and more peaceful meal. We will spend one more day in central Pennsylvania and then move on toward the Pittsburgh area on Friday. Sometimes I get a little nervous about spending 90 days living out of a minivan and a pop-up camper with three other people. Granted, these are the three people I love most in the world. And two of them are relatively small… but this size difference is quickly compensated for in the volume of stuff needed to take care of these little people. So while most of the time I am just completely excited about this trip, sometimes I start to think about space and logistics and I feel a bit claustrophobic. Along the same lines of concern, we just signed a lease on a smaller (by about 25 square meters/270 square feet) 2 bedroom (compared to the 4 we have now) apartment that we’ll move into just a couple of weeks before we leave for our trip. Good timing, I know. And since we won’t really settle in and live there long before we leave, I’m hoping that after these months on the road, the apartment will feel palatial and spacious in comparison. Or at least comfortable and reasonable. I don’t regret choosing this apartment and I really think it will work out fine. But still, I get nervous sometimes. Let me pause and acknowledge what a first-world problem this is. I know that there are people living in their cars with all their worldly possessions, and people who sleep on the street because they have no where else to go. Women in Africa raising 8 kids in a one-room hut with no windows and a thatched roof that leaks. These people, if they’re gracious, would laugh about my space worries. This perspective is both helpful and humbling, but I still get a little nervous sometimes anyway. The key, both on the trip and in our post-trip life, is good stuff management. Only having what we really need and what we really want, and organizing those things well. This is, of course, much easier when packing for a vacation than packing for a move. But I’m hoping that this trip will teach us a new appreciation for the lightness, freedom and flexibility of a life lived with less stuff and that we will get a lot closer to only having the things that we truly need, use, and/or love. So life at the Lindström’s has shifted into major reduction mode, and so far it feels great. Today I asked myself why I have enough socks to wear a clean pair everyday for a month without doing laundry, and why I still have that box of grade school certificates. Okay, I was good at school. But no one over 30 has any business hanging on to an honor roll certificate from the 4th grade. In my opinion at least.